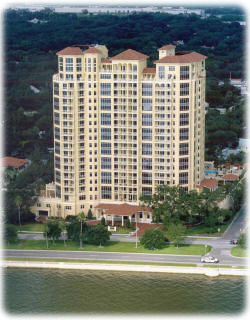 Tampa's Bayshore Boulevard is synonymous with gracious Florida living. Here residents enjoy the finest conveniences and comforts, including private elevator entries, wine cellar with private storage lockers, theater, library, conference center, concierge services, two social rooms, two elegantly appointed guest suites - even a fragrance garden. Every detail in this 22-story collection of 64 homes has been finely tuned to this locale's unique characteristics, just as JMC has anticipated the needs of Florida's most discriminating homeowners for nearly 30 years.